To the delight of many (including yours truly) and undoubtedly the dismay of others, the U. S. Board of Geographic Names (BGN) has voted not to officially change the name of one of the peaks of our own Presidential Range. Earlier this month, the federal agency decided not to approve a proposal that would have changed the name of 5,533-foot Mount Clay to that of Mount Reagan, in honor of Ronald Reagan, our nation’s 40th President. In an 11-0 vote, with one additional abstention, the BGN decided to retain the name that was bestowed on the peak more than 160 years ago, citing continued use of the older name in recent years and the board’s general reluctance to alter historic names. The peak is named for Henry Clay (1777-1852), a southern statesman and orator from Kentucky who went on to serve as U.S. Speaker of the House of Representatives and Secretary of State. The effort to rename the peak after President Reagan dates back to 2003, when the Republican-controlled New Hampshire General Court passed legislation approving the name switch. The name change was part of a nationwide effort under way at that time to name one prominent place in each state after Reagan. Despite passage of the state law, however, there has been virtually no usage of the name “Mount Reagan” to refer to the summit, which lies just north of Mount Washington. In fact, the altered name appears on no current hiking maps, and does not even show on the official state highway map, which still identifies the summit as Mount Clay. According to Lou Yost, Executive Secretary of BGN’s Domestic Names Committee, the board’s May 13 vote on the proposed name change “was no reflection on President Reagan, it is just that the board does not like changing names.” He noted that over the last couple of months the board accepted public comment on the proposal and most of it— including about 160 emails— was against changing the name. This past winter may have been a relatively mild one here in the mountains, but Old Man Winter still left his unmistakable mark on certain parts of the region, such as the Bretton Woods-Zealand Valley area. I few recent trips up to the Cog Railway base area and a drive along the recently opened Zealand Road revealed that both locales were hard hit with wind, snow and ice damage over the past six months. The most impressive damage can be seen along portions of the Cog Base Road and along just about the entire length of the Mount Clinton Road, which connects the Base Road with the top of Crawford Notch. To all you holiday weekend hikers headed into the Pemigewasset Wilderness Area, don’t forget that the suspension bridge across the East Branch of the Pemi a little more than a half-mile beyond the Bondcliff Trail no longer exists, and that the section of the Wilderness Trail between the Bondcliff Trail and the bridge is now officially closed. Removal of the 50-year-old span last fall effectively eliminated the popular 11-mile loop hike that formerly began and ended at the Lincoln Wood Visitor center off the Kancamagus Highway in Lincoln. This loop allowed hikers to walk up one side of the river and return via the opposite side utilizing the Lincoln Woods, Wilderness Cedar Brook, and East Side Trails. Technically, of course, it’s still possible to make the loop, but the crossing of the East Branch at the site of the former suspension bridge has to be considered unsafe at best and in times of high water flow would probably be near suicidal. In other words, play it safe and don’t try crossing the East Branch. Mike Dickerman photo The Kinsman Ridge Trail, besides serving as a link in the Appalachian Trail, runs nearly 17 miles from Kinsman Notch to Franconia Notch and boasts one of the toughest miles of the AT in New Hampshire, that being the steep climb up South Kinsman from the south. Once upon a time, when I was younger, thinner, and substantially more ambitious, I would spend night after night poring over maps as I planned my next overnight backpacking trip. In those days of yore, when lugging around a 35- to 40-pound pack didn’t seeming anywhere near as daunting as it does today, I’d routinely take off on multi-day excursions to destinations in the White, Green and Adirondack Mountains of the Northeast. Many of these adventures found me tramping along Vermont’s 260-mile Long Trail or some northern New England section of the Maine-to-Georgia Appalachian Trail. Other times I’d incorporate some peakbagging into my itinerary, especially when I was in hot pursuit of the New England 4000-Footer list. While my backpacking days are now but a distant memory, I still love talking to hikers about trips they’ve either just completed or are about to undertake. I’m amazed, in fact, at how many queries I receive on the subject, especially when visiting my longtime hiking cohort Steve Smith at his Mountain Wanderer Map and Book Store in Lincoln, or when I meet up with my nephew, a U. S. Forest Service backcountry ranger who spends most of his time patrolling the inner recesses of the Pemigewasset Wilderness in the White Mountain National Forest. Certainly there is no shortage of options when it comes to White Mountain backpacking. With the AT weaving its way across the region, and hundreds of miles of other trails within a 90-minute drive of anywhere in the Whites, the choices seem limitless to the uninitiated. Pemi Horseshoe: Considered perhaps the most rewarding multi-day trek in New England, this classic route circumnavigates the heart of the Pemigewasset Wilderness by way of the Twin-Bond, Garfield, and Franconia Ranges. This 31.5-mile loop begins and ends at the Lincoln Woods Trail off the Kancamagus Highway and features visits to eight 4000-foot summits. Several others are also easily accessible via short side trails. Highlights include the summit vistas from Bondcliff, Mt. Bond, South Twin, Mt. Garfield, and Mt. Lafayette. This hike is best done over four days and three nights, with layovers at Guyot, Garfield, and Liberty Spring campsites. You can do this trek in either a clockwise or counterclockwise direction. If you go clockwise, which is the way I recommend, you’ll start off on the Lincoln Woods Trail and then steer left onto the Osseo Trail for the stiff climb up to Mount Flume. You then head north on the Franconia Ridge Trail until reaching the open summit of Lafayette. The Garfield Ridge Trail then leads you over Mt. Garfield and continues on toward the Appalachian Mountain Club’s Galehead Hut. From Galehead, follow the Twinway to its intersection with the Bondcliff Trail near Mount Guyot, then take the Bondcliff Trail all the way down into the East Branch valley, where you’ll turn right onto the Wilderness Trail and in five or so miles be back at the Kanc. Kinsman Ridge Traverse: Appalachian Trail hikers know all too well the not-so-niceties of the Kinsman Ridge Trail, which runs nearly 17 miles from Kinsman Notch (Route 112) north to Cannon Mountain and Franconia Notch. On the map, this trail doesn’t appear anywhere near as difficult as it really is, especially along its southern reaches. But a full-length traverse of Kinsman Ridge features an endless series of tiring ups and downs, with the ascent of 4,358-foot South Kinsman from the south probably the most treacherous and steepest. The final attack on Cannon’s summit cone from Coppermine Col is nothing to laugh at either, especially if you’ve been on the trail for several days and have lost some of your earlier vim and vigor. Shelters at Eliza Brook and Kinsman Pond provide overnight accommodations for backpackers. There are also several tent platforms at Kinsman Pond. Wildcats-Carters Traverse: Situated as they are directly east of Mount Washington and the Presidential Range on the opposite side of Pinkham Notch, the peaks along Wildcat Ridge and the Carter Range offer up some of the most spectacular mountain scenery in New Hampshire. The rewards are hard earned, however, as anyone who has backpacked the length of the connecting ridges can attest. Trampers going south-to-north are immediately faced with the difficult scramble from Route 16 up to Wildcat Ridge. This is one mean ascent, even for someone lugging a simple daypack. The ridge walk over the various summits of Wildcat is pleasant enough, but the sharp descent down to Carter Notch, and the equally sharp climb from the Notch up to Carter Dome, is enough to test the hardiest of hikers. In the course of this 18.7-mile journey, hikers pass over six 4000-foot summits, with Carter Dome and its spur peak, Mt. Hight, probably the best of the bunch. The view west towards Mt. Washington and its many glacial cirques is among the finest in the Whites. AMC’s Carter Notch Hut and Imp Shelter are situated approximately 7.5 miles apart and allow for a comfortable three-day, two-night traverse of the ridge. Kilkenny Ridge Traverse: If you’re looking for a true wilderness experience on your White Mountain backpacking tour, then this is the trip for you. An end-to-end traverse of this outpost ridge in the northern reaches of the White Mountains covers more than 24 miles and includes ascents of Mts. Cabot and Waumbek (both 4000-footers), plus numerous other peaks such as Mt. Starr King, the multi-summits of Mt. Weeks, and Terrace Mountain. The Kilkenny Ridge traverse begins on Route 2 in Jefferson on the Starr King Trail and terminates 24.2 miles north at the South Pond Recreation Area off Route 110 in Stark. From the summit of Waumbek north, the Kilkenny Ridge Trail runs the final 20.6 miles. Highlights of the trek include the substantial views from Mt. Cabot, Rogers Ledge and The Horn, and the likelihood that you’ll see few hikers other those converging on the two 4000-foot peaks along the way. Mike Dickerman is a longtime hiking enthusiast, award-winning columnist, and author or coauthor of nine books related to the White Mountains region of New Hampshire. He lives in Littleton, N.H.
Mike Dickerman photo This is the former Ammonosuc Ranger District building in Bethlehem, which has been abandoned by the Forest Service and the property has pretty much been completely neglected. Another publication certain to be of interest to area mountain enthusiast is a new hiker’s guide and map to the bedrock geology of Mount Washington and The Presidential Range. Authored by J. Dykstra Eusden, Professor of Geology at Bates College in Maine, The Presidential Range: Its Geologic History and Plate Tectonics describes the bedrock geology and plat tectonic history of the Presidentials with color illustrations and a writing style that make this information accessible to all who have an interest in New England’s highest mountain range. Finally, White Mountain National Forest officials have announced that Resolution Shelter along the historic Davis Path near Crawford Notch has been closed “due to safety concerns associated with the deteriorating condition of the shelter.” Since this structure is within the Presidential-Dry River Wilderness Area, don’t expect the Forest Service to replace this facility. Instead, it will be dismantled and backpackers will be forced to make alternate overnight camping plans. The shelter is located approximately 3.7 miles from the Davis Path trailhead off U.S. Route 302, not far from the summit of Mount Resolution and Stairs Mountain. 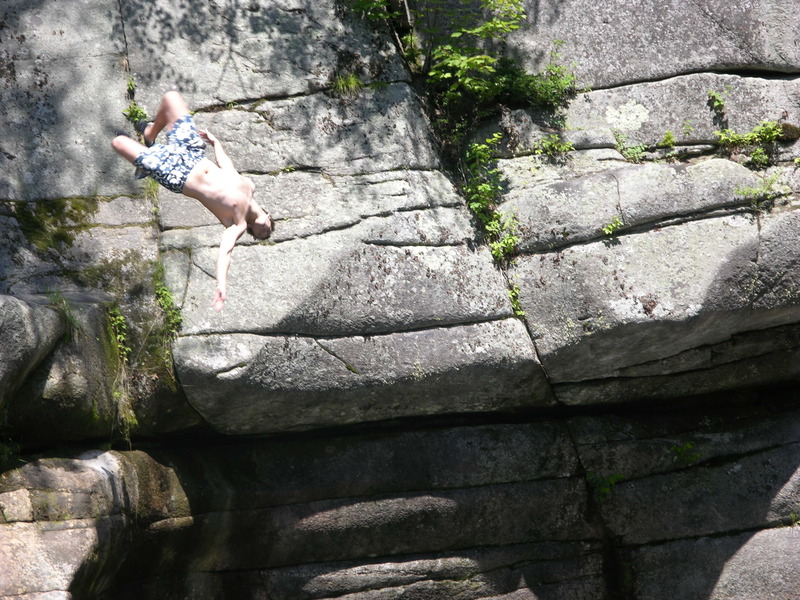 A daring diver shows off his stuff at Upper Falls. It had been 26 summers since I’ve felt the stingingly cold water of Upper Ammonoosuc Falls. 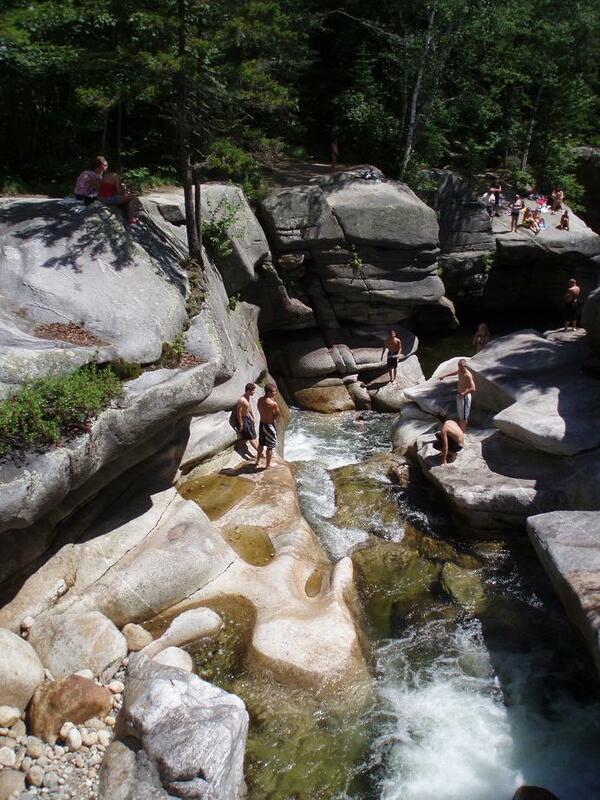 This natural swimming hole sits at the foothills of Mount Washington. It is a place of beauty, danger and intrigue. Every Saturday on my way to the dump, I pass by David and Andria Craxton’s organic farm, Roots and Fruits. From the road, I peer through the towering evergreens that are like the curtain that hides the true identity of the great Wizard of Oz. I wonder how Farmer Dave pulls it off – producing so much food with such little impact on the environment. He’s the area’s most prominent and prolific gardener, yet he forgoes many of the most basic modern tools that seem to be a necessity to most small backyard growers and farmers. He feeds many of us through his stand at Lancaster’s Farmers Market (each Saturday morning), but consumes relatively little fossil fuels by practicing sustainable, organic and local agriculture. His wisdom and success lies in listening to the land. Last fall, I let my wonder get the best of me and invite myself over for a tour. Along the way, I get a tutorial on organic gardening and local food. Farmer Dave is a quiet, reflective man with deep thoughts and few words. His wife, Andria, on the other hand, uses her artistic photography and poems to vividly communicate their shared passion for the land. Dave’s three decades of “playing in the dirt,” have not muddied his agrarian idealism, adherence to ancient farming principles or creative curiosity. 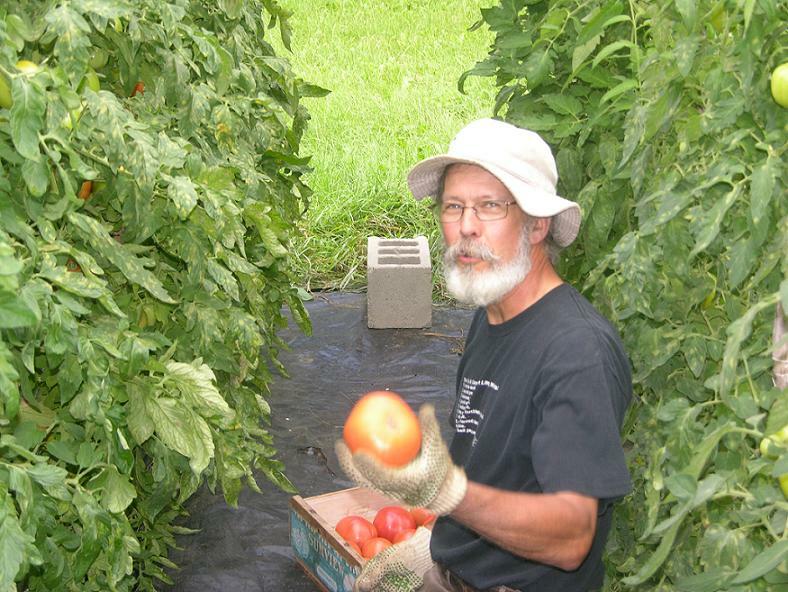 If there is one guiding principle at the Roots and Fruits Farm, it is that product cannot be separated from process – even if the process is backbreaking (or as Dave calls it “time consuming.”) He uses a broad fork to open up the land instead of a rotatiller. He cuts with a scythe, rather than a weed whacker. The key, he says, is to “work the land in a gentle way” and build the soil by enriching it with good compost and rotating crops. This year the Craxton’s installed 8 solar panels that further reduce their electric consumption by one-third. NORTH COUNTRY – Across the North Country people are noticing that trees – mostly white pines – are changing color. This time of year the trees are expected to be a lush green, not a fall rust-brown color, but that’s exactly what’s happening. 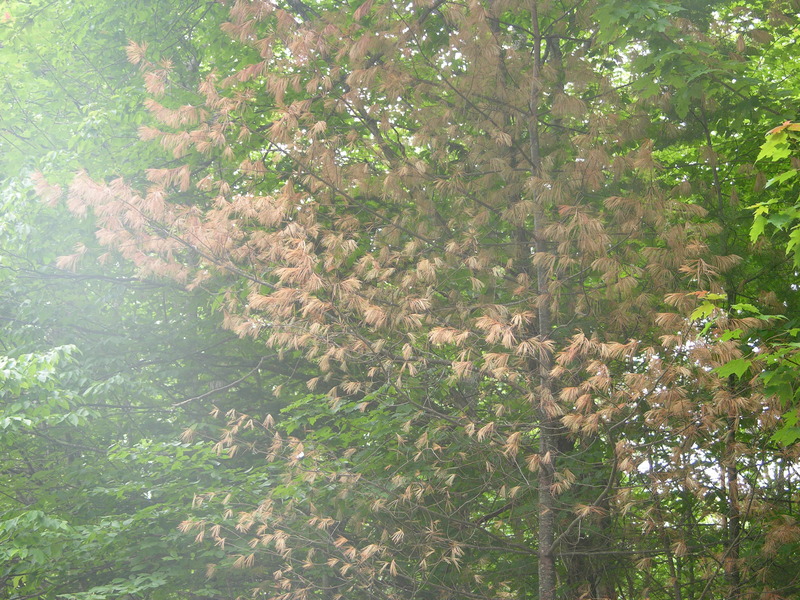 Kyle Lombard, Forest Health specialist with the N.H. Division of Forests and Lands, says, “We are seeing a couple of different disease fungi causing white pine needlecast. We started seeing a little needlecast here and there in the last few years, but this year it’s epic.” The fungus is caused by the abundance of rain during the previous two springs. Coos County’s recently retired Forester Sam Stoddard said the condition is “a bit new to me.” He compared it to “salt spray,” which causes some road-side pine trees to brown because the road salt dehydrates the needles. Both, “fungus and road salting are not killers,” said Stoddard, “they will re-foliate.” He cautioned people against taking any action; especially wrongly assuming the tree is dead and cutting them down. There are a hundred different kinds of fungi that attack different species, Stoddard said, and it is not uncommon to see a similar effect on other trees, especially Spruce trees. Ironically, the two most northern counties have vastly different supplies of trees formally known as the Eastern White Pine. “Coos County doesn’t have a lot of White pine. It is more incidental,” Stoddard said, but by contrast “Grafton County is the pine basket for the state.” Spruce and fir are more prevalent in Coos County. Charlie Baylies, a forester from Whitefield, noted that the White Pine is “one of the most valuable tees as far as volume.” It is a popular wood for finished construction work, he said, because it’s “easy to work.” Mike Doolan, of Littleton-based Saw Log Bulletin, a specialty publication that follows the market, said the price of White Pine “stays pretty consistent.” The average price, he estimates, to be between $250 and $300 per one-thousand board-feet. The price does vary by quality. Stoddard offered a historical explanation for the differences between Coos and Grafton counties. During the Colonial period, the white pine was a valuable New England staple, so much so that old-growth pines, which reached 200 feet tall, were deemed to be the property of the King of England. In the original town charter of the town of Shelburne (near Gorham), White Pine “was protected by the King,” he added. It was used in ship-building, especially for the long mast and keels. The tree’s sticky resin, when boiled becomes turpentine, offered an added benefit as a perfect water-proofing agent. After the Civil War and the abandonment of New England farms for westward expansion, the trees flourished in the sod around old farm land. These trees, some 50 to 100 years later, were cut to supply the building boom of the Industrial Revolution and Gilded Age. There is not a simple explanation as to why the White Pines took off in one area, rather than another, but what is certain is that as the sod broke down and the soils changed, other species took over. Ten year-old Mathew Roy with a tiny camera in his extended right hand slowly moves closer to his target, which is about 20 feet away. His mother and half dozen other on-lookers hang further back focusing on the same spot. In the distance loud fireworks explode into the hot muggy night. 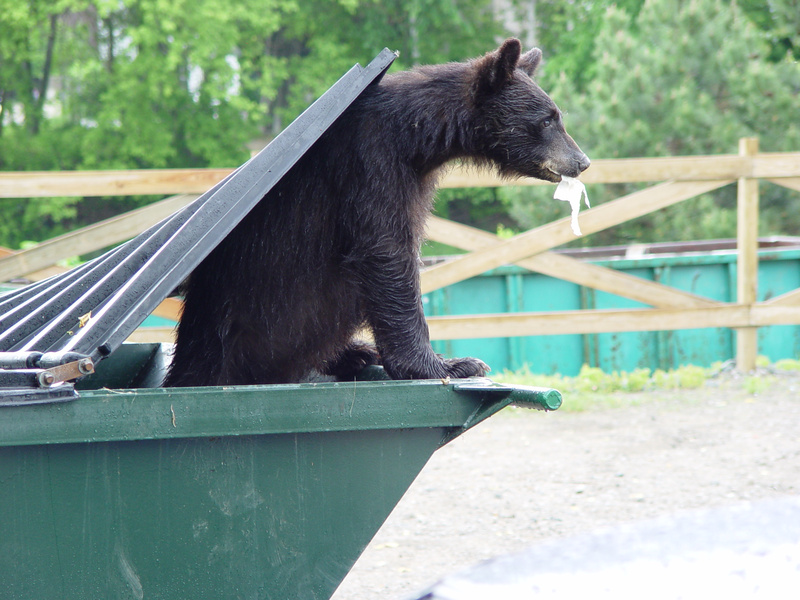 The amusement is a large female black bear lumbering through on open apartment dumpster on Bethlehem’s Main Street, next door to the Elementary School. Spewed all around as far as the eye can see is evidence of the frequency of this activity. 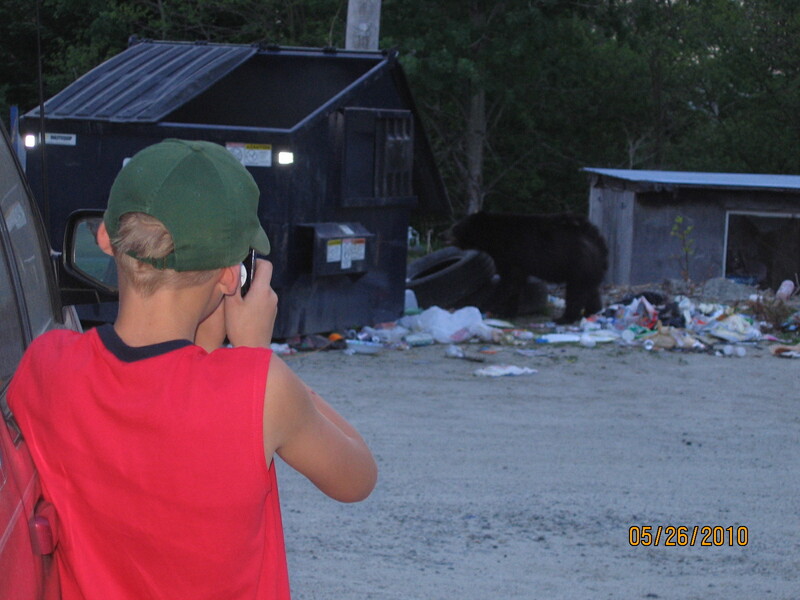 Barbara Roy, of Bethlehem, who stopped to get a glimpse of the animal with her son, says she’s “not really” worried about the safety of the situation and neither do many of the other people gathered around the dumpster.